Yesterday saw the funeral of Henry Allingham, one of the last 3 British veterans of the 1st World War. Next Thursday, the city I work in will grind to a halt for the funeral of Harry Patch, the last of our servicemen who experienced the Trenches. The only other surviving Brit, Claude Choules, now lives in Australia. With the passing of Allingham and Patch, the reality of fighting in the Great War has passed out living memory in Britain. While it is inevitable that World War One will eventually become a part of history like Agincourt or Hastings, we need to keep actively remember its reality for as long as possible. We owe it to those who fought for freedom, to those civilians who died on both sides and to our combatants acting out of a similar sense of duty and responsibility to their own countries. The Great War was the "war to end all wars". The century since has given the lie to this. A second World War was followed by a myriad of other conflicts. Almost daily we hear of another death in Afghanistan. The residents of Wootton Bassett line the streets of their town on a weekly basis as bodies of deceased soldiers are returned for burial. In this context, remembering past sacrifices becomes both more important and more poignant. The past week should give us pause to reflect on the impact of war. On the human cost of destroyed houses and infrastructure, injuries and death. On the waste of life on all sides. It should make us stop and consider what lessons we have learned (and failed to learn) from our history. War can be necessary. War can be justified. But it is does not occur in isolation from the rest of society. As the philosopher John Donne said "...any man's death diminishes me, because I am involved in Mankind." This is why the events and sacrifices of the First World War remain relevant today. If you have not heard or read the Poet Laureate, Carol Ann Duffy's poem on this subject, I urge you to read it here. The poem is entitled "Last Post" and the audio version is spine-tingling. Shock, Horror: Cream is fattening! If you were to go out to dinner, would you expect a menu to detail the calorie count of a slice of Black Forest Gateau? How about if you fancied an ice-cream with cherry sauce and a flake, would you be surprised at the fat and sugar content? I suspect that, for the vast majority of people, the answer to both these questions is no. So how about if you fancied an iced coffee drink? Perhaps one made with full fat milk, cherry flavoured syrup, chocolate and cream? Wouldn't it strike you as obvious that it's not going to be the most slimming drink ever? If you had one a day for a month, wouldn't you expect your trousers to be a bit tighter? For these reasons, I was surprised to see this news item on the BBC News website today. The World Cancer Research Fund has examined the nutritional tables available from the main coffee shops and decided to highlight that creamy drinks can lead to being overweight and a higher risk of cancer. Now I'm sure the charity does a lot of good work in it's day job of "funding cutting edge scientific research" into cancer but there are a number of responses that sprung to my mind. These ranged from, "it's not exactly rocket science" to " No sh*t, Sherlock". I'm all for people making informed choices - particularly in a retail environment - but surely some things are blatantly obvious? Sugary, Creamy drinks contain lots of calories. Large Sugary, Creamy drinks contain more. No-one buying a Large Dark Berry Mocha Frappuccino is going to think they've gone for the healthy option. P.S.... In case you're wandering, a large McDonalds milkshake contains almost as many calories. Look out for a story regarding the dangers of those - coming to a "News" outlet near you sometime soon. Which of the following events do you think will be widely reported on the news tonight? 1. 2008 World Champion Lewis Hamilton wins his first Grand Prix of the year with a commanding performance in Hungary. 2. In just two years, and at the age of 24, Mark Cavendish has become the first British man to win more than 8 stages at the Tour de France . 3. Bradley Wiggins has finished fourth in the Tour, matching the previous record for a British man in the competition. The answer, of course, is the first one. Formula 1 is loved and followed by millions of people. It's a sport in which the Brits have a great history and heritage and where a number of teams have their bases. It's glamourous, wealthy and highly commercial. Cycling, by contrast, is a bit of a cinderella sport. While it has benefited from National Lottery funds, and a governing body which has invested in a training infrastructure designed to achieve World and Olympic medals, it has not really reached into the popular consciousness in the same way. Despite the haul of cycling golds at last years Olympics, precious few people will be aware of the continuing plaudits achieved by our cyclists. Indeed, few people will be interested in cycling until the 2012 Olympics roll round. Now, I'm not wanting to be hypocritical about this. I'm not pretending I've been following every twist and turn of Mark Cavendish's achievements in the past year while I have been following every twist and turn of F1. I'm not expecting cycling to become the focal point of sports bulletins or the BBC to broadcast "Ride of the Day"
The point I want to make is that we have sportspeople out there, in various sports, competing either directly or indirectly for this country week in, week out. And when they achieve personal bests or outperform their predecessors, we owe them a bit more than an "and finally" in the news. While it would be easy to turn this blog into an online journal detailing every facet of my life, I am reticent to do that. While I could recount my daily doings in great detail, the minutiae of my life really isn't that exciting. Ask anyone who knows me, and they will be recount the sinking feeling they get every time I start an anecdote with "Well,..."
This isn't to say that friends and colleagues will never make an appearance - just that these will be the exception rather than the rule. And because "them that asks, don't get", I'll not be doing requests. This policy does, however, make blog writing harder. Rather than reportage, I find myself looking for things to hang blog entries on. In the course of an average day, several ideas present themselves and get discarded, parked or forgotten! Hence the reason my blog entries have not been as frequent as I originally intended, for which I apologise. That said, I think things are going reasonably well. Your comments are always appreciated. I'm keen to keep things varied and suggested titles or themes would also be welcomed. In addition, I also have some ideas for interaction in mind, once (if) my readership increases. The Rubble Club has been established as an organisation dedicated to buildings that have been deliberately destroyed or altered in the lifetimes of their architects, but without their involvement. I first became aware of it through this BBC News article about the Forth Road Bridge Tollbooths and Canopy. The site has a Scottish bias at present, but as time goes on, more and more from the rest of the UK will be featured. Background details are provided for each entry with the opportunity for comments to be added in each case. The Ghostbikes site is a completely different proposition, although it is also about remembrance. In this case, it is about the memory of cyclists who have died in road accidents. A bike is stripped of it's working elements and painted white and then chained to a suitable spot near the accident. A plaque can be added to give details of the deceased. A photo of the bike is then posted on the site with further details as a tribute. One of my colleagues heard about ghostbikes on the wireless and a quick Google search found the site. While it may seem a bit ghoulish, particularly when looking through it as a third party, I think it is a simple but effective way of highlighting the dangers that cyclists face on the roads. The final site in this selection is the official Iain (M) Banks site. Iain Banks (without the M) is one of my favourite authors, and I dip into this site now and again for updates on publication dates, interviews and other features. If you are unfamiliar with his work, the site features information of each of his books to date. I would, personally, urge you to check out The Wasp Factory which is one of my all time favourite novels. This is the first in a series of occasional entries featuring works by some of my favourite artists. They are exhibited with minimal comment. Where possible I've linked to the Galleries in which they hang in real life. 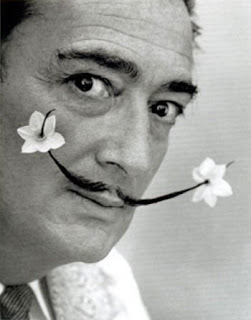 This room is dedicated to Salvador Dali, the great surrealist. 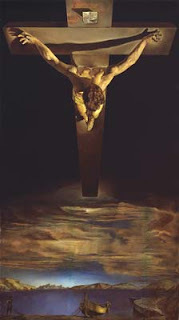 Christ of St. John of the Cross is more figurative than most Dali paintings, but is, ironically, my favourite Dali and one of my favourite paintings by anyone! It hangs in the excellent Kelvingrove Museum and Art Gallery in Glasgow. 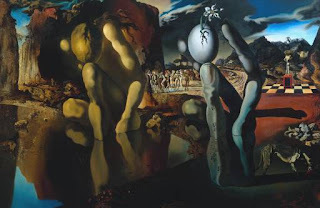 Metamorphosis of Narcissus was one of the first Dali paintings I fell in love with. It is part of the Tate Collection. This is not so much a painting as a collage. Oieseau (Bird) is composed with sand and gravel forming much of the surface. It is, perhaps, slightly gruesome, but I find it intriguing. It is on permanent display in the Dean Gallery of the National Galleries of Scotland. 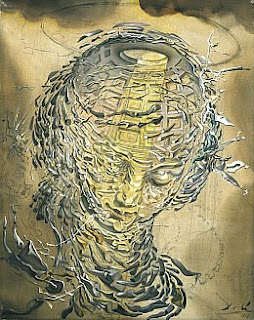 Another painting in the collection of the National Galleries of Scotland is Exploding Raphaelesque Head. The final piece I've chosen is Face of Mae West which can be used as an Apartment. A video of the installation can be seen here. 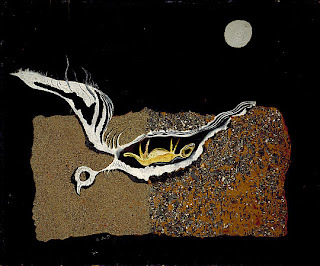 It is in the collection of the Fundacia Gala-Salvador Dali at the Teatre-Museu Dali. 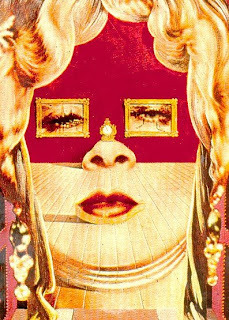 I could have chosen many more examples, but these give a flavour of the variety of Dali's work - it wasn't all melting clocks! Once upon a time, I'd have engaged in a spot of schadenfreude at the plight that England's Cricketers found themselves in yesterday. Like many young Scots, for reasons I won't go into at present, I'd have enjoyed the spectacle of England being made to suffer in a game they invented and that I didn't understand. Now I take a more mature attitude with views tempered by age, a greater understanding of the social as well as political importance of the Union and by living in England. I also have a much better understanding of Cricket. So as the wickets fell yesterday, I felt disappointed for England and their prospects. It looked like they were staring defeat in the face in a first test that has not been a great advert for English Cricket. From the choice of Cardiff as hosts, thorough the apparently irresponsible play of Kevin Pieterson, to the gamesmanship at the close, the whiff of controversy has never been far away. The timewasting that characterised the late stages, and helped (at least) to force the draw, was particularly disappointing. Test Cricket is a game which, far more than most, trades on its history and heritage and The Ashes are at the centre of that heritage. There is an expectation that the game be played in a gentlemanly fashion absent in other sports. Overs played in sessions punctuated at civilised intervals by lunch and tea. Wickets are readily acknowledged and the Umpire's decisions are respected. Perhaps it's inevitable that Cricket will go the way of Football and, more recently, Rugby Union. Perhaps the advent of Twenty20 has brought an attitude that will inevitably spread to the 5 day game. Perhaps I'm being unduly sentimental and old-fashioned in resisting changes to the way the game is played. Whatever the future, though, come Thursday I'll be hoping for a good match, played with respect and sportsmanship. And I'll be hoping for an England win. The site features streaming pictures and short pieces on each participant. I'm likely to come back to this topic in future as I know someone who is taking part, and still considering applying to do so myself. This is a non-entry directing you towards my newly-completed profile - see left. As is the way of these things, it can but be a snap-shot of me and my feelings as I worte it. The favourite film list, for example is a random list of films that sprang to mind and misses out, for example, The Breakfast Club, one of my all time favourites. Notable exceptions could also be found in the lists of books and music I like - I'll be giving myself a good kicking later. As an introduction it should give you a flavour of what I'm about and, in part, what to expect from future posts. Welcome to my new blog. Aside from a brief flirtation with blogging through my MSN account around 3 years ago, this will be a new experience for me, as well as you. So, what should you expect? Well, it may take some time to settle into a rhythm, but I imagine I'll post every two to three days. I don't intend to bore you with the minutiae of my life. Instead, I hope to write on a variety of topics - Art, Literature, TV, Radio, Politics, Current Affairs, Architecture and Music spring to mind. I also hope to point you in the direction of websites of interest and other blogs that have grabbed my attention. If you want a taste of my writing style prior to my first proper post, you can find a guest blog entry on my friend Stephen's blog. My entry is here. I look forward to many more entries - and comments will always be welcome!